A child is never too young to be taken along to the dentist and we love seeing new babies at Dental fx. You will always find a willing baby sitter if mum is also having an appointment! We have a dedicated children's area with colouring pens, paper and books while children are waiting to see the dentist. Dr Nahida Roy is the dentist at Dental fx who will be taking care of your children, and as a mum of two herself, she knows how important it is to bring children to the dentist as early as possible. Fluoride applications are a safe, easy and effective way to safeguard your child’s growing teeth from developing decay. The fluoride is painted onto the surface of the teeth, which helps to mineralise them. Tooth-coloured fissure sealants are applied to the biting surfaces of children's teeth to prevent decay. We find this to be very effective and doesn't take long to apply. Studies have shown that the younger a child is when attending their first dental appointment, even if just for a check-up or to be introduced to the dentist and the surgery, the more likely they are to have a positive experience growing up unafraid of the dentist. Dental fx will take special care of your child to make them feel safe and cared for. Treating a child from a young age also allows the dentist to spot early signs of underbites, cross bites or overbites developing. 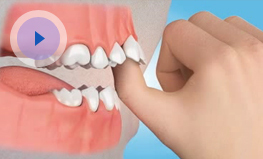 As with most dental problems, the sooner we can treat this, the quicker it can be resolved. If we feel it is necessary we will refer a child for an orthodontic assessment to one of our specialist referrers. Prevention is always better than cure, so please call us today to make an appointment for your child. Regular check ups will provide ongoing life benefits such as healthy teeth and gums , reduced risk of developing tooth decay and reduced need for fillings. And also importantly, bringing a child regularly to see us at Dental fx will reduce the chance of fear and phobias developing as they get to know us and have a very positive experience each time they attend.